The Cubs were the only team to beat the Dodgers in the last 11 attempts, but like in their last series, the Dodgers started things out with a win. Thanks to the 2-1 victory, they have now won four games in a row. Duane Underwood Jr. made his major-league debut tonight, and he was promptly greeted by a 41-pitch 1st inning that included Matt Kemp taking a 14-pitch walk to load the bases. He then probably got jolted a bit when Yasmani Grandal hit a deep fly to the warning track in center, but he got out of the trouble without damage. In the 2nd, it took a grand total of one pitch for Enrique Hernandez to give the Dodgers a 1-0 lead with his 13th homer of the season. The offense didn’t do a whole lot else though seven innings, unfortunately. 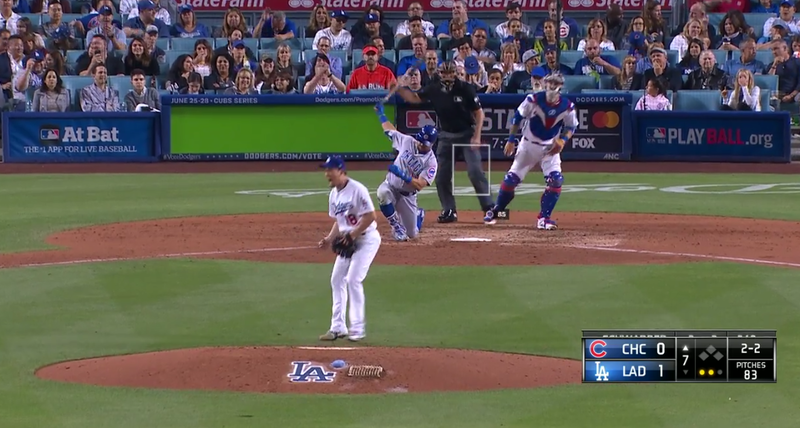 A prime scoring chance in the 6th was erased thanks to an excellent Javier Baez relay after a Cody Bellinger double that was kicked by Kyle Schwarber in left. That was about it. Thankfully then, Kenta Maeda had it working after quite frankly still looking injured in his first two starts back off the disabled list. He cruised through seven innings on 84 pitches, allowing just three singles and more importantly just one walk. In fact, the Cubs had just one at-bat with runners in scoring position against him all game long, and he neutralized chances for luck with nine strikeouts. Scott Alexander the entered in the 8th, which I guess is a bit controversial, but Kenta looked like he was going back on the DL last start so I get it. Anyway, Alexander as a high-leverage setup man is a problem, as he immediately proved by allowing back-to-back singles. He then showed why he was acquired, by inducing two grounders to get out of it, including a way-too-dramatic double play to hold the lead at 1-0. Chris Taylor then pinch-hit in the 8th and provided the Dodgers with much-needed insurance thanks to his 9th homer of the year. It turns out that was important, as it was barely enough for Kenley Jansen, who entered and induced an infield fly but then gave up a single, balked the runner to second, and allowed another single to puts runners at the corners. Jansen then got away with a middle-middle cutter that ended in a deep fly to center for a sacrifice fly to cut the lead to 2-1. However, he rebounded and got a check-swing dribbler in front of the plate for the save. Well … that was exciting. 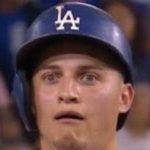 The Dodgers are now 42-35 overall and still just 21-19 at Dodger Stadium. They also (finally) cut into the NL West deficit as the Diamondbacks lost and now just lead by 1.5 games. With a win tonight, the Dodgers will be in playoff position for the first time this year. Somehow that is apparently true. In an unlikely duel of aces, Ross Stripling will face Jon Lester tomorrow at 4:00 PM HST/7:00 PM PST/10:00 PM EST.